Eleven days ago, a solar eclipse occurred at nine degrees 21 minutes of Virgo. 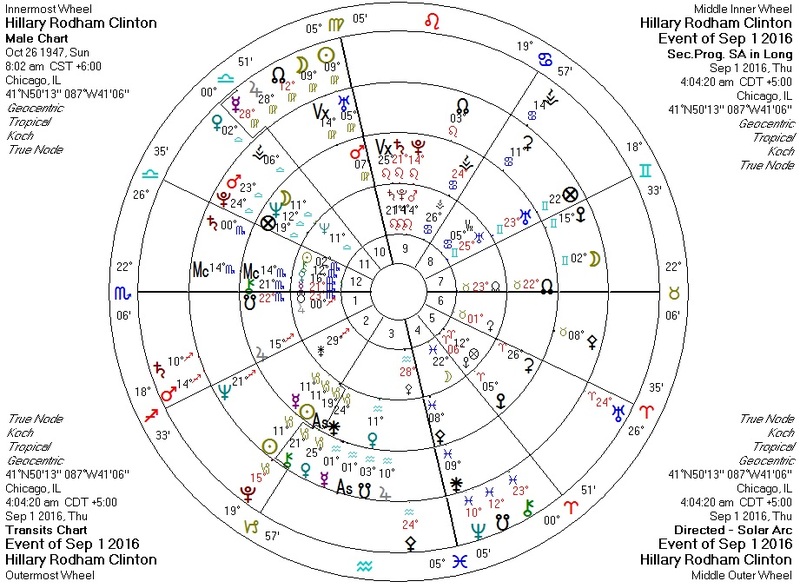 This is four degrees from Hillary Clinton's (presumed) MC and solar arc Uranus (suggesting neurological issues?). It is also two degrees from Clinton's progressed Mars in Virgo (suggesting mobility/health issues?). Since then, visible health issues have cut short her public appearances twice (here's yesterday's collapse). Drudge is in full attack mode, with no less than a dozen links to articles citing Clinton health problems. The DNC is reportedly holding an emergency meeting to set up contingencies in the case that the Democratic nominee withdraws from the race. One prominent libertarian is now jokingly endorsing Clinton on the grounds that she is more likely than Trump to die in the first few months of office and thereby throw the entire federal government into disarray. If the birth time we have for her is correct, Clinton has the South Node very tightly conjunct her Ascendant. In my experience, this aspect in itself is a significant health warning -- persons with this aspect who try to "conquer the world" rather than humbly work with others tend to run into landmines on their way to godhood. More specifically, this aspect (or South Node conjunct Mars), in my experience, has some correlation with instances of Parkinson's disease. Here's one example.